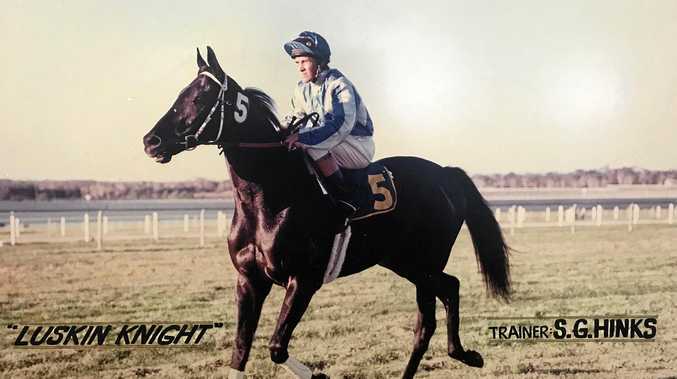 Luskin Knight, trained by Stuart Hinks. JOCKEY Michael Cahill has continued his impressive form after clocking up a treble midweek at Doomben. He went on to claim four winners at Ipswich on Friday. His first win for the day came aboard the Marcus Wilson-trained Shinstar who has shown recent form after running second at Ipswich last start. Cahill's partnership with Helen Paige's filly Lady McCabe proved too strong for the Class 2 field with her hitting the front on jumping. She is becoming an Ipswich specialist with all three of her wins having been at the track. Cahill's third win for the day was aboard Uno Amor, who was first-up paying handy odds of $18. The filly made it look easy in the three-year-old maiden cruising to the line after hitting the front and finishing five and three-quarter lengths ahead of the field. His final win to give him more than half of the card was aboard Barefoot Tycoon who held off his competition by only a neck to win the Class 3 Handicap 1200m for Gold Coast trainer David Fletcher. Robbie Fradd also had a good day at the office claiming a double with wins on Papa Jo and Errol. He has been in superb form since returning from a successful stint in Mauritius where he racked up 35 winners to claim the premiership. ZARREEN moved back in class to find some form and win the Class 1 Plate for Jon Walk. It was his second win at the track after claiming his maiden win back in September this time ridden by Luke Tarrant. Last start he was a $101 chance with punters seeing value with the drop in class picking up $21 for the win. IPSWICH racing stalwart Stuart Hinks Snr was bid farewell at his home track of Bundamba last week after a battle with cancer. The trainer lived across the road from the front gates and the track was his backyard where he trained no more than a dozen horses at the time. Some of his favourite gallopers included Luskin Knight (pictured), Jolly Back, Jayelem and Blushing Blonde. A final farewell by his family and friends was marked with the trainer traveling one last lap of the track. He is survived by his wife Heather and sons Greg, Peter and Stuart jnr. BOOKINGS are open for our private marquees at the 2019 Channel Seven Ipswich Cup. This year we have two areas available to host your own private party. The Infield Festival Private Marquee area offers guests the best of both worlds - access to view the track and to enjoy the DJ festival. The grandstand side has premium trackside views and is sure to have a strong following. Space is limited and will be offered to last year marquee holders first. It is strongly encouraged to lock in your private marquee for 2019. Contact the Club on 3282 1500, or email marquees@ ipswichturfclub.com.au to confirm your booking. WORKS are continuing to progress well for the new racing facility and hospitality centre at the Ipswich Turf Club. A major milestone will be met in the coming few weeks as work has prepared the ground for the concrete slab to be poured for the main building. This will house the jockey's and steward's rooms as well as the second level Member's Lounge, which will double as an events centre.